When in a car accident, it can be difficult to know exactly what to do. Emotions are through the roof, bodies are in shock, and the visual and auditory displays of emergency vehicles instill a certain sense of panic. However, it is critical that you maintain your self-awareness throughout the incident. 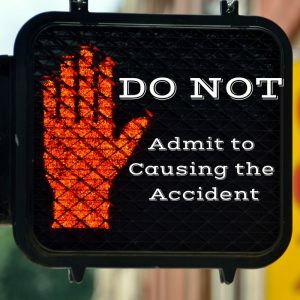 In this article, we will discuss 11 things that you should not do after you experience an accident. No matter if the injuries seem benign or the damages minor, it is important that you call the police immediately after the accident. 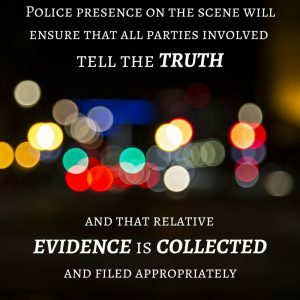 While it may be nerve-racking to call in the boys in blue, their presence on the scene will ensure that all parties involved tell the truth and that relative evidence is collected and filed appropriately. 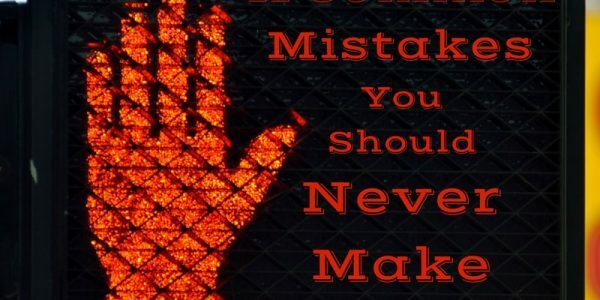 The information in the police report could prove very useful in the case later, and the simple act of calling the police may exonerate you from unnecessary scrutiny. Not calling the police can potentially raise questions amongst the jury and the insurance companies as the case develops, so it is of grave importance that even if you believe you may be at fault, to call the police and utilize their expertise in evaluating the scene and the stories surrounding it. Underestimating your injuries and neglecting to seek medical attention can not only hurt your case, but it can also leave your unseen wounds untreated and unaccounted for. Even if you crawl from the wreckage of a fender bender unscathed, it is important that you do not say, “I’m okay.” Instead, inform first responders that you do not need an ambulance at this time and explain any symptoms you notice in the present moment. Much like the police reports, doctor’s visits and any treatments related to the accident will be filed in the case report. If you fail to see a doctor immediately, the insurance companies may even hold it against you in an attempt to claim that you were not actually injured. As such, it is imperative that you consult with a medical professional after enduring a car accident; it could be the icing on the cake that not only keeps you healthy but also proves to be the piece of evidence that can lead to a fair settlement without the need to go to trial. Even though the first responders on the scene will be gathering evidence, it is important that you don’t rely entirely on the authorities for this information. In our day and age, we are fortunate enough to have miniature computers at our disposal nearly 100% of the time; meaning that unless you are being wheeled away in an ambulance immediately after the incident, you should collect contact information for witnesses, capture photos of your injuries, and take as many pictures of the scene that you can. All of the information that you gather will prove quite useful in the development of the investigation, and depending on the quality of the evidence, may even provide the insurance adjusters with enough information to determine who is at-fault. Remember, when it comes to an investigation, you can never take too many pictures. 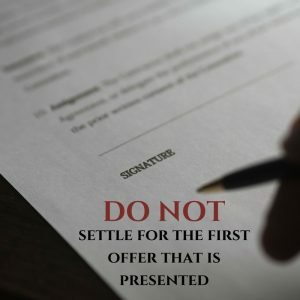 While accidents and their subsequent investigations can be grueling and drawn-out, it is important that you don’t settle for the first offer that is presented. Insurance companies will often approach you with an initial settlement; however, more often than not, the initial claim is far less than the projected rehabilitative and surgical costs to come. 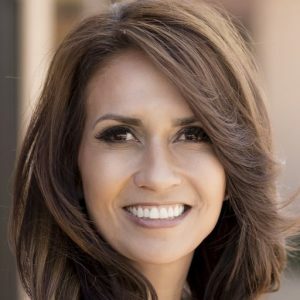 Pursuing the case to the fullest extent of the law will demonstrate your diligence and fortitude to the opposition, as well as grant you a better chance to receive the compensation that you deserve. Consulting with an attorney early on in the investigation will assist you greatly in receiving ample compensation for any injuries you have suffered and any damage-related costs. Insurance companies will tell you not to acquire the help of an attorney, but don’t listen to their senseless whims. They are only whispering sweet nothings in your ear because if an attorney gets involved, they will make less money. 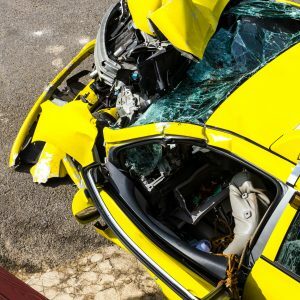 Certain studies have shown that accident victims who acquire the help of an attorney receive up to 3.5 times more compensation than those who don’t. It goes without saying, an attorney can make all the difference. Defense attorneys and insurance adjusters alike tend to use social media to spy on claimants and find reasons to slander their claims. They will use any information they can find to discredit you and the information you provide. Case in point, be mindful and aware of the information that you post on your social media accounts after an accident. 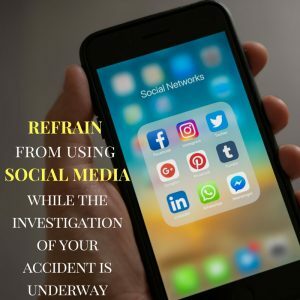 In fact, it may be more beneficial in the long run to refrain from using your social media while the investigation of your accident is underway — the less ammunition they have against you, the better. As ludicrous as it may seem, there is a deadline for our legal rights called the Statute of Limitations. When it comes to filing a lawsuit, the Statute of Limitations expires after two years, meaning that your case is no longer valid once that threshold is crossed. 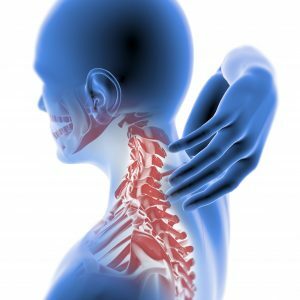 It is very important that you deal with all of the aspects of your accident as soon as possible. Consult with an attorney, seek medical attention, file a police report, and compile your evidence immediately to ensure the development of a strong case on your behalf. The longer you wait, the less likely that your lawsuit will deliver. 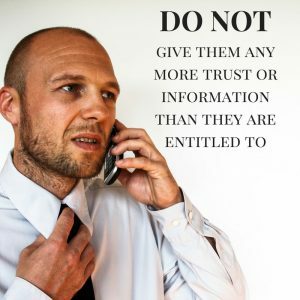 No matter how nice the defense attorneys or insurance adjusters are, don’t give them any more trust or information than they are entitled to. Do not agree to a recorded conversation, and most certainly do not give them any information regarding your injuries or personal life. All information is simply more ammunition for them in building their case against you. In contacting an attorney at the beginning of the investigation, you can avoid these traps and give yourself some peace of mind. The less that you have to deal with the opposition, the more likely you are to succeed in receiving your compensation. One of the most important resources when conducting your own investigation of the accident is third-party testimonies. Obviously, both sides are going to be challenging one another’s perspective in order to win the lawsuit, but what about the passerby who saw it all go down? When you are in an accident, one of the first things you should do — along with taking pictures and calling the police — is getting contact information for any and all witnesses at the scene. If you wait for law enforcement to arrive to gather all of this information, some of the witnesses may already be gone by then. Remember to stay centered, calm and polite when interacting with witnesses; the tension is high enough as it is, and yelling at someone for the information is not going to make it any better. While the deal may seem substantial at first glance, it is important to remember that the insurance companies are doing everything in their power to pay you as little as possible. As such, it is imperative that you take everything the insurance adjusters say with a large rock of salt. Before you make any deal with the insurance companies, I would highly suggest that you get an attorney involved to look over the deal and assist you in handling your negotiations further. Even if you feel that you slammed on your brakes too hard or that you were following too close, do not admit to causing an accident. In the moments following an accident, emotions are running high and the parties involved may even be in-shock to some extent. In light of this, it is of grave importance that you remain neutral when providing informative details until you can consult with an attorney. Otherwise, you may just put the nails in your own coffin. At Hale Injury Law, Las Vegas and Henderson residents have access to the best auto-injury attorneys in the valley. If you or a loved one has been in a car accident and are in need of legal counsel, contact your local attorneys at Hale Injury Law for a consultation. Don’t struggle through your case alone. Get help from the experienced Henderson Personal Injury Lawyers at Hale Injury Law. Hale Injury Law is an aggressive personal injury law firm devoted to representing accident and injury victims.